The Pulse Density Modulation Interface Controller (PDMIC) is a mono PDM interface controller and decoder that can be connected to a silicon digital microphone. With the Linux PDMIC driver you can easily record sound from this simple connection setup. This ALSA System on Chip (ASoC) layer driver embeds a digitallly controlled gain, a High-Pass and a SINCC filter. The usual ALSA capture interface can be used to interface with this driver. The arecord application is the reference implementation for such an API. It tels explicitly that the Card 1, device 0 is the capture interface. When these are 2 ALSA cards such as on the SAMA5D2 Xplained, you need to select the proper interface for configuring it. Then you can move to the Capture screen using the TAB key and be able to adjust the capture volume. With my setup, it seems that a capture volume above ~16 (Mic [dB gain: 43.00]) leads to a saturated result, keep the gain below this level. Connecting a silicon digital microphone is very simple with the PDMIC interface. Only a data and a clock lines must be connected to the PDMIC entries. 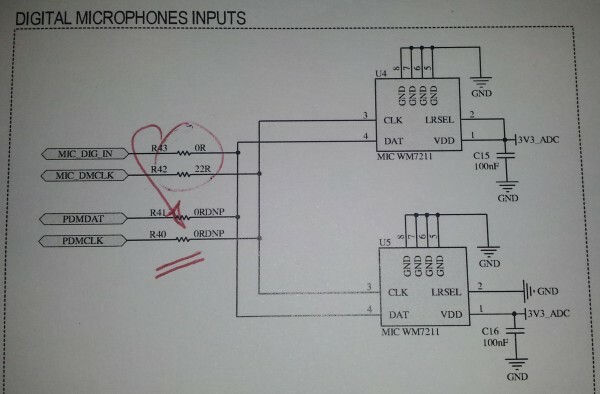 You can take the example schematics below or the on simple connection guidelines in the datasheet of the silicon digital microphone. Select the proper ALSA interface according to the chapter above: #Identify_the_driver_for_PDMIC.